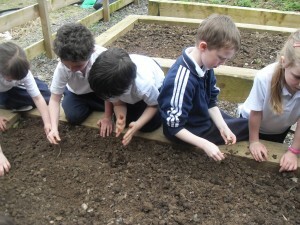 In 2008 it was decided to develop an organic garden to the rear of our school. Children were consulted throughout the planning process and thoroughly enjoyed drawing up plans in maths class and three dimensional designs in art class. Eventually, a simple garden plan of six raised rectangular beds with a central herb area was decided upon. The site chosen for the garden has a sunny aspect, at the rear of the school, sheltered by mature trees and with the majestic Knocknarea mountain as its backdrop. Parents were invited to engage in the creation of the garden, which they did with great enthusiasm. Local parents provided wooden sleepers to frame the raised beds and soil was provided by a generous local farmer. 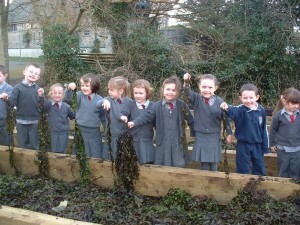 Seaweed from the local Voya Seaweed Baths as well as manure from our local Sligo Riding Centre was mixed into the soil to enrich it prior to cultivation. A low level wooden fence was erected to enclose the garden and later a willow “ fedge “ was planted against it . 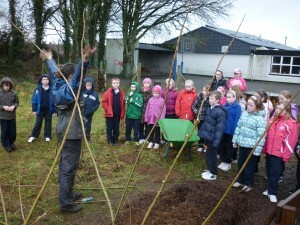 Senior classes visited the Organic Centrein Rossinver , Co Leitrim to learn about organic gardening. They learned that plants belong to different families and that it is traditional organic practice to grow vegetables from the same family together in one bed and move it to another the following year by way of a crop rotation system. The main crop family lists are, Onion (Scallion, Onion, Garlic), Brassica (Cabbage, Swede/turnip, Broccoli, Radish), Legume (Peas, Beans), Root Crops (Carrots, Parsnip, Beetroot) and Potato . Others including lettuce, pumpkins, courgettes, spinach, chard which don’t fit into the main categories, will grow happily alongside any of the above . We have practiced this crop rotation system in the garden with each class taking charge of a particular bed and planting seeds from a particular crop family. The children have enjoyed food prepared and cooked in the school kitchen using the crops they cultivated. At Hallowe’en, pupils have enjoyed pumpkin soup made from the pumpkins they grew in the garden. In summer, pupils have made rhubarb fool from rhubarb also grown in the garden. Runner beans , peas , cabbage , turnips , strawberries , onions , beetroot , and numerous potato varieties have been grown successfully and harvested from the garden . In 2012, we left the beds fallow and planted Green Manure Mustard. This plant is dug into the soil to add nutrients and rejuvenate the soil. Each year we plant vegetables in the Organic Garden and harvest them in Summer, when appropriate, and in Autumn. This year, 2016, because of a cold frosty Spring, it was May before we planted our peas, beans, potatoes, cabbage, beetroot, lettuce and radishes. Seamus, the school caretaker, has set up a mesh fence to support the peas and beans as they grow. We have a problem with rabbits in our area and they like to feast on our produce, so the vegetables may have to be covered by mesh in order to protect them.